They were cute once, iffin you didn’t already know it. My beloved tweety birds which dart about the pond-side pit here, happy-go-lucky, flirtatious, and like I say, cute. 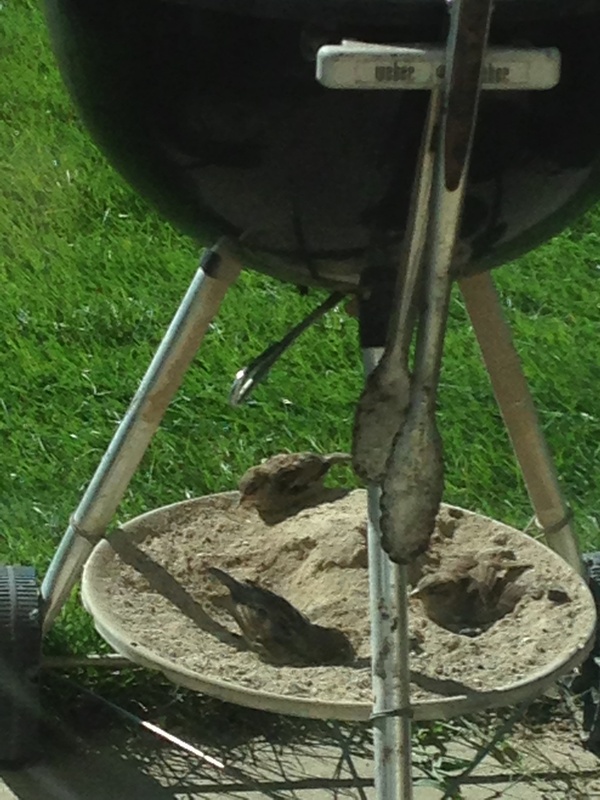 But this morning as I stepped out on the patio, beverage in hand, I find a gaggle of them floundering fancy in the ash pan residing beneath the old kettle grill. Flopping about there, doing their best wildebeest impressions, antics oft reserved for the dusty plains of Botswana. Their little feathers cloaked in ashen debris, kicking up little gray clouds of it, which scattered in the morning breeze. What a bunch of goof balls, I thunk. Rolling around like pigs in the mud. Like puppies in the grass. Like grown men in the ball pit at the Burger King. They were having a good time at it too, and I nary could convince them otherwise. But then again, I wasn’t trying to. I’ve long admired blokes, you see, who make the best of things. When your bird bath is as dry and filthy as a Weber ash pan, and you look like a bird who has just endured a volcanic blast, yet you still frolic with great and unbridled enthusiasm, well my hat is off to you little bird. Not conformed by conventional thinking or naysay, but emboldened perhaps, by the cliché cup of lemonade that awaits you – you made the best of things, and you did so with the least of things. You did it with a pile charcoal ash. I guess they were just washing themselves, or something akin. Tweety birdologists could enlighten us, I suppose. But I say if their goal was to get out the other side of this activity cleaner than they began, well, they failed miserably at it. I had me some dirty birds at the pit today. Some very dirty birds indeed. Anyways, lunch was a trifle cleaner you might say, and probably better tasting too, than tweety birds rolled in ash. We henceforth evicted them of their little health spa, and fired up a chimney of coals. 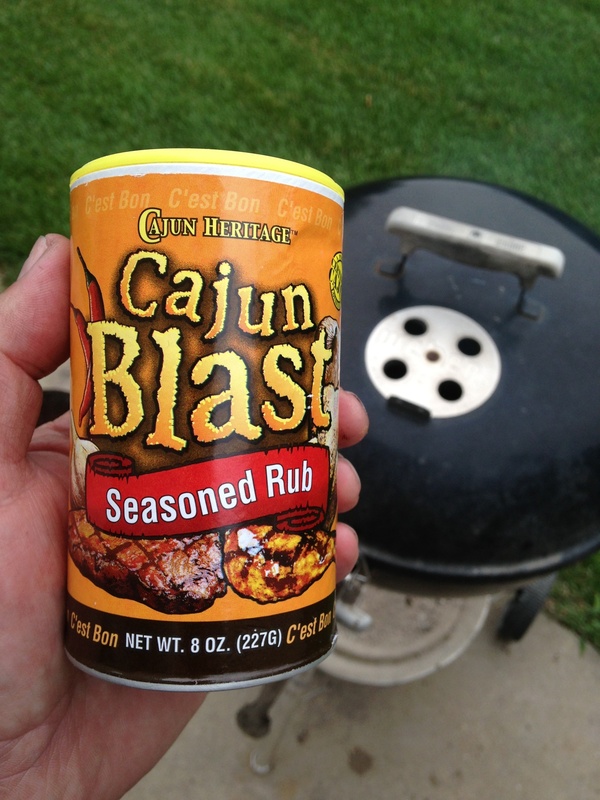 And whilst those coals matured, we sprinkled some of this Cajun Blast Seasoning over two portly patties of 80-20 ground beef. We were burger hungry at the pit today, I cannot deny. But then if you asked us most days what we would fancy, a good hamburger is usually at the top of the list, and rightly so. For they are a rather filling affair of meat and bun. Easy to do. And quick too, if that is how you like to bend. But above all that, burgers are just plain good, and nothing more needs to be said about that. 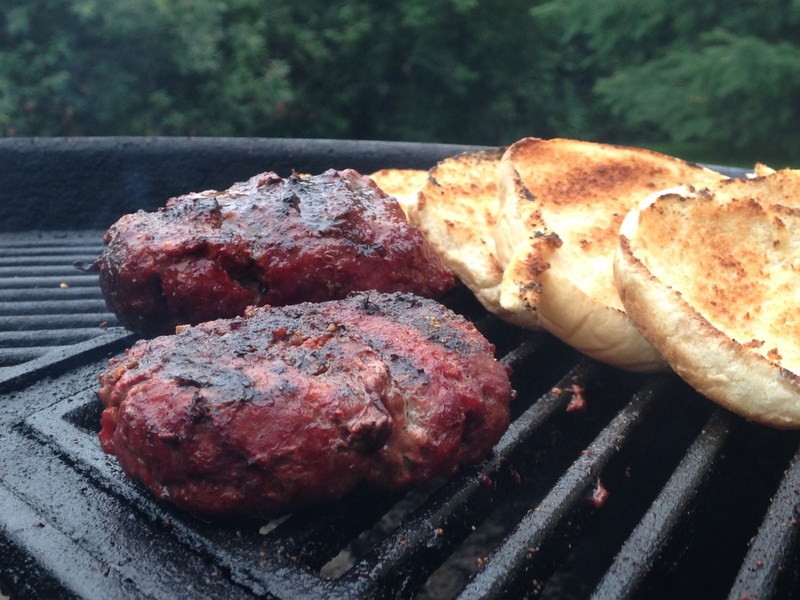 You all know how to grill a hamburger, so we shan’t prolong here the intricacies of it. 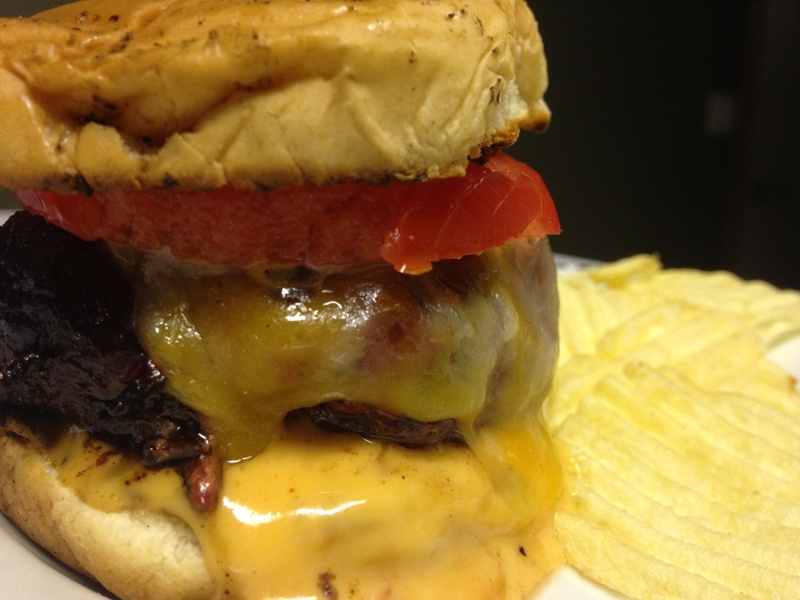 A hamburger is personal anyways, as every pit keeper embellishes his or her own unique touch on it. Like a finger print, perhaps, no two burgers are the same. A burger proper is but a reflection of your mood that day. Some days you’re feeling spicy, other days just plain. Some days you’ll hanker for the works, plucking everything and anything out of the refrigerator door. While still other days, you’ll just stick a fork in your burger and eat it like meat Popsicle. It’s all good in Burgerville, and that is precisely what makes them so wonderful. We tossed some cherry wood into the coals for to smoke there, and brought the burgers to a state of well done, just before of course, toasting the buns. We almost always toast our buns, if but to add that extra texture so lovely in a hamburger. Then melted some medium cheddar cheese as a matter of course, added a slice of tomato from the garden folds, and lastly, and totally fueled by impulse here, squirted a shot of Thousand Island-like salad dressing on the bottom bun. Man! As I plated up, sunbeams swept across the green lawn. Clouds the shape of pork chops and wiener dogs idled overhead, and a gentle breeze with subtle kisses of autumn mingled through the fluttering tree tops. Tomatoes ripening before thine eyes. Bean plants sprawling. Honey bees buzzing. The ninth inning of summer was going strong. And yet another span of moments pit-side, sealed in that smokey vault of memories. Satisfied, my plated spoils in hand, I stepped into the house, sliding the screen door shut behind me. And just then, and rather out the woodwork, three little tweety birds fluttered up on my six, and with a cheerful chirp, lit again into their hallowed ash pile- floundering around there in little gray clouds stretched by the wind. I smiled quietly. What can you do. I had some dirty birds on my hands today, and that’s all there is about it. But they were cute once, I tell you, they really were. Come to think of it, they still are I guess. And burgers are always good. Amen. I can’t go often in life without music. Creating playlist or soundtracks as I like to call them has become a hobby of mine. Matching music up to what I’m doing at that moment. To become the musical director for my life is something I take serious. Being that I’m a musician, I’m very picky and biased when doing so. To go into the many avenues of life and tell you about my music selections would probably force me to start another blog, so I’m going to focus on sharing of my music stations I have created when dedicating an afternoon at the BBQ pit. 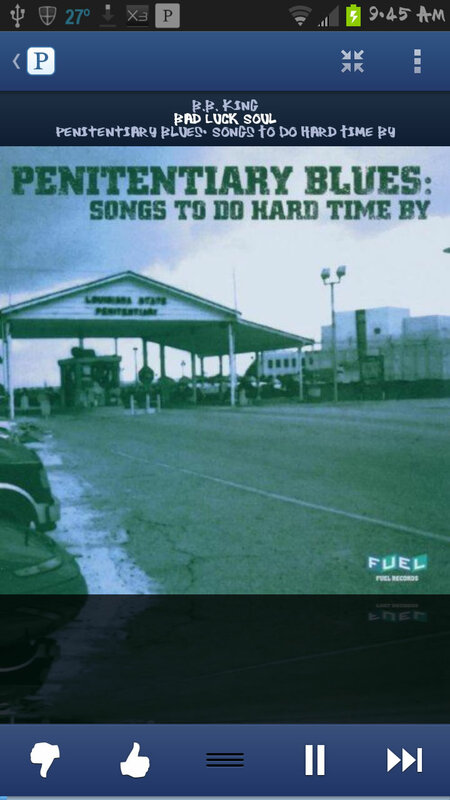 First off, who could go wrong with a B.B King station. How often is it you walk into a BBQ joint and they have classical music, or rap playing on their overhead speakers? What music is better associated with BBQ than blues music. The crying guitars whine as your basting your meat. The harmonica calls out while the hickory smoke curls into a dimming orange sunset. The singer cries as they have lost their lover over, perhaps over someone else’s BBQ. My B.B. King station of course is always my first choice of serenades when standing next to a smoking pit. 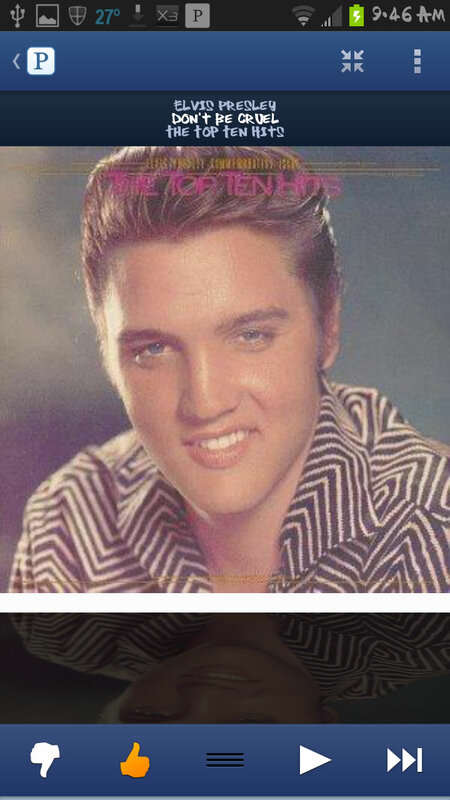 My second choice is my Elvis station. I grew up listening to Elvis and have many fond memories of establishing myself on a sunny afternoon. Our backyard patio packed with Aunts and Uncles. My dad sat with his banjo and my Uncles sat with guitars, often livening up the family with classic rock and roll tunes and old country western songs. This station is often listened to because of the strong feeling of nostalgia it brings on. I can remember words of songs I hadn’t heard in 20 years purely because I fell in love with the moment I first heard them. Thus, Elvis often joins me when BBQing for large groups of people. Now there is a station I don’t often brag about. This station is played in my headphones so many people don’t judge my geeky side of life. But here, I hide nothing about my BBQ experience. 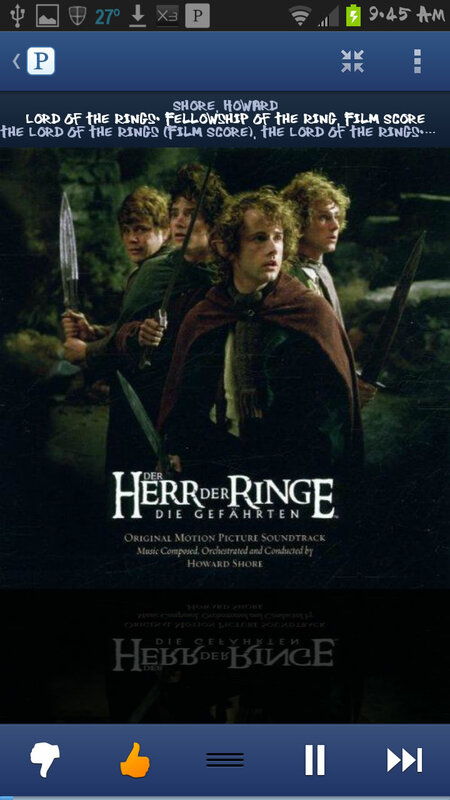 So I would like to publicly announce the third choice of station is my Lord of the Rings Soundtrack station. I use this station when having a full day ahead of me – of a long drawn out smoke. When smoking a cut of meat that may need a little more effort. From the point of lighting the flame to pushing a sharp knife through that saucy, sweet, smoky, spicy side of meat. You then know your efforts have paid off and the epic journey of BBQ was fulfilled. No other station encourages such BBQ geekiness as my Lord of the Rings Soundtrack Station. So, my question is to you who have read this, what music do you like to listen to during an afternoon at the pit? What might be on your BBQ playlist?